Wailea in Maui has the best weather on the island to make every beach moment count. 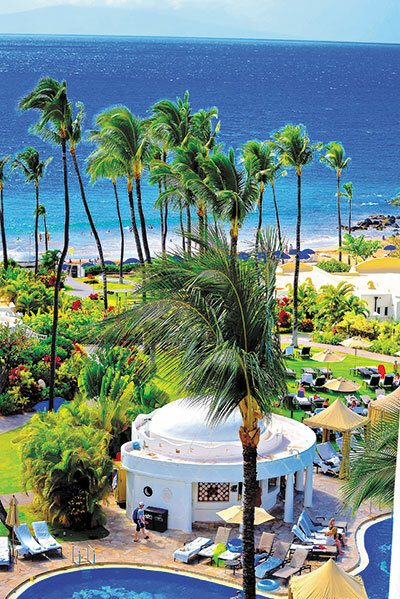 The Kea Lani Fairmont is perched there for a whale of a view, literally. “Aloha” with floral leis for wahines, manly thick-beaded leis for kanes, and cute tiki sea turtle necklaces for the kiddies welcomes arrivals. Since the recent completion of a three-year, $70m renovation, the reception and alfresco areas on every floor are spacious and facing the Pacific. There are many hidden spots throughout for secret retreats, sweet with tropical blooms and scent. Also sweet are the culinary options at the Fairmont restaurants, starting with an expansive breakfast buffet. Ko, which means sugarcane has garnered many awards including Maui Restaurant of the year. Formerly serving Italian cuisine, with not a drop of ethnic blood among the chefs, they decided to combine the flavors of the team heritages. In the sugar cane era, a boat sailed around the world picking up cane harvesters in China, Japan, Philippines, and Portugal. Led by Executive Chef Tylun Pang, Ko now pays homage to each of these cultures, resulting in a rich menu. The Moscow mule has really kicked the cocktail scene and Ko has their own derivative – the Molokai Mule, which is 1.5 oz of Grey Goose vodka, 3 oz ginger beer and 1 oz lime juice, garnished with candied ginger and an orchid blossom, served, of course, in a copper cup. From starters to plantation traditions, the Makai catch, specialties and desserts like the upcountry Pao Doce Frito, Portuguese sweet bread stuffed with cream and raspberry jam, at the end of the meal, you might feel stuffed, too. Don’t worry it is nothing a stroll along the beach won’t cure. Feel the sand between your toes or take the higher trail above, smooth for walking or jogging. This is ritzy row alongside Four Seasons, The Grand Wailea, The Wailea shops and homes selling for $28m, all with access to the Wailea Golf Club, where three courses reflect the beauty and ruggedness of tropics along the foothills of Mount Haleakala. Each course flows freely along the lava rocked hillsides with mesmerizing views of surf and majestic rise of mountain turf. Favorable landing zones divided by valleys and coarse, dense, shrubbery present a fun test of resort golf. The RTJII designed Gold course is annually in the top ten best to play. The practice area is complete for game improvement and the shop is well equipped. Kea Lani’s Willow Stream Spa opened last year for after golf or instead of, with treatments similar to those of the Fairmont Princess in Scottsdale. The amenities are not the same, nor are they necessary when you have the slide pool for families or tranquility pool for adults only, all leading out to the grassy lawn with lounge chairs and ultimate service continuing down to the beach. Sunscreen, aloe and infused water are available to all as well as rental boats, paddleboards, snorkel equipment and even Go Pro cameras to capture aquatic memories. While Turtle Town is just down the coast, these magnificent sea creatures love to visit the Kea Lani Fairmont shore too, making unforgettable encounters. The water is just fine year round for body surfing, or floating. Or, walk to the end of the beach and snorkel around the rocks for a kaleidoscope of fish. A massive sea turtle was resting in the same spot among the coral both days we swam by. Rumor has it he was frolicking with another turtle just off the beach the day before. He must have been exhausted. When guests are ready to retire, all 413 accommodations at Kea Lani are luxury suites, creatively redesigned. Balconies overlook the elegant resort layout and ocean. Open the door for a wave serenade. Authentic Hawaiian experiences, like canoeing, sushi or lei making, hula (of course), and ukulele lessons fill in the gaps between pool or ocean laps. Ukelele strumming is very trendy and it turns out we all have a little Don Ho in us. Evenings bring live musical performances by professionals you really do want to hear, a nice accompaniment to the nightly torch lighting ceremony. In native garb, the conch shell is blown and a torch is carried to ignite the flames throughout the grounds. Don’t worry; no one is voted off the island. In fact, you will surely want to linger longer at Kea Lani where dolphins and whales are often the best and simplest entertainment.